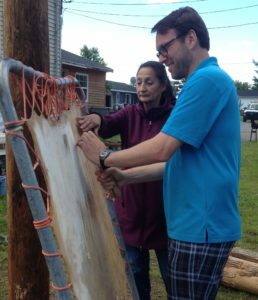 The Bachelor of Education at Cape Breton University (CBU) in Sydney, NS has recently developed a Sustainability Concentration for some of the program participants. This concentration came out of rising focus on sustainability education that works hand-in-hand with the efforts to Indigenize the curriculum. The melding of Indigenous and sustainability education came together in ways that were expected because of the many intersections of these two approaches to teaching and learning, namely through community- and place-based education. In order to develop the four courses that represent the concentration in sustainability, the program leads, over time, connected with local First Nations communities. The Eskasoni Mi’Kmaw Nation is about 40 km outside of Sydney and Membertou Nation is in Sydney. The new program emerged in 2009, and the leads knew they wanted First Nations education included, so they reached out to the communities and created dialogue. A First Nations concentration also emerged, with the focus on language preservation – also a strong sustainability issue – so the four course concentration in FN emerged at the same time as sustainability. Both evolved and intertwined organically.